What is today our La Châtaigneraie campus has a complex history, dating back to the opening of the Ecole Nouvelle du Léman 1908. By the mid-1970s there were actually two schools operating there: the Collège Internationale de La Châtaigneraie, which was in severe financial difficulties, and the Lycée des Nations, whose need to rent additional space there was an indication of its growth and success in Bellevue. Ecolint's Governing Board purchased the buildings at La Chât and it was the 1974 merger with the Lycée des Nations and the United Nations School (Pregny-Rigot) that created the Foundation as we know it today. We thus have many alumni that started their education at the Lycée and testify to the positive influence that the Lycée spirit brought to the Esprit Ecolint. In June 1980, when the Lycée's former campus at Bellevue was finally closed, a commemorative brochure was produced. It included the text below, written by former teacher Barbaba Scheiwiller-Andrews, who told the story of the tumultuous early days when the school came very close to disappearing altogether. The complete text of the commemorative brochure is available in our From the Archives section. It's hard to believe that almost ten years have elapsed since that August day in 1964 when I first arrived in Switzerland to join the staff of the Lycée des Nations. Still vivid in my mind is the initial shock and dismay of finding that the reality was very, very different from the rosy picture which had been painted for me at my interview in London. I had been promised a long-established school (founded by the League of Nations) of over one thousand students, with a staff of around eighty, housed in a modern glass and concrete building, with acres of playing fields, a fully equipped gymnasium, its own yacht, and a large library of which I was to be in charge. Instead, I found a school which was to open its doors for the first time in just a couple of days, housed in the villa at Bellevue which we all know so well. The one thousand students proved on opening day to number around twenty in the Anglo-American section and a slightly larger number in the French section. The French staff numbered around eight, and on the Anglo-American side there were four of us. Later we learned that there had, in fact, been a fifth; he'd arrived a day or two before the rest of us, taken one look at the set-up and had promptly returned to England. I am sure that if the four of us had known, that first evening, what the future months were to bring, we'd have done exactly the same. I know I gave it serious thoughts even without knowing what was to come, and I suspect I was not alone in that. But I was young and optimistic, full of the adventure of being able to live and work abroad for the first time - and proud. Too proud to have to return shamefaced to all the friends and relations who'd wished me "bon voyage" just a few hours before. I soon discovered that the Lycée was being founded by a Frenchman, with no teaching qualifications, as a moneymaking venture. He had appointed an expatriate Englishman as Headmaster of the Anglo-American section and was proposing to run the French section and do the general administration himself. Many of the teachers in the French section were unqualified, many were part time. The four of us in the Anglo-American section Were all qualified, but comparatively inexperienced, ranging in age from 22 to 25. Between us, we had to teach all subjects, except French, to grades 1 through 9, 11 and 12 (grade 10 was missing, as there were no enrolments for that grade). It meant, of course, constant doubling, trebling and quadrupling of classes, with no time off for marking or preparation. With plentiful books and equipment, it would have been difficult but not impossible. We soon discovered that books were virtually non-existent and equipment consisted of chalk, blackboard and a couple of balls for physical education. Obviously, the first thing to do was to remedy that situation, but where were the catalogues to choose from? Where were the shops to supply us? Where was the money to pay for it all? Two weeks after the Lycée opened the Headmaster of the Anglo-American section walked out and not heard from again. We four innocents were left holding the can, not only for the teaching in our section, but also for the administration (the French Director spoke no English), and for the establishment of some sort of timetable and syllabus. Them, for the first time, we heard the words "work permits". What was this? Did we need permits? But of course, everyone knows that! We didn't. Nor did we know how to set about obtaining them. We found out, the hard way of course like everything else. Three of us eventually obtained the magic pieces of paper; the fourth, for some unexplained reason, didn't. The authorities gave him twenty four hours to leave the country. Were we to be reduced to three? No, he said, they'd have to throw him out physically if they wanted him to go, so we all sat tight and waited. Nothing happened and several months later the permit suddenly appeared in the post, with no further demands or explanations. That, however, is jumping ahead in time. In the autumn of 1964 we were headmaster-less, friendless beyond the four of us, without contacts, but with 20 little (and not so little) students eagerly awaiting the arrival of Education! We decided we could survive, if we obtained the co-operation of the parents. Accordingly, we organised a sausage and soup barbecue in the garden of the Lycée, never realising for a moment what far-reaching effects that first step was to have. The parents turned out in force, social contacts were established, and for the first time since we'd arrived in Switzerland, we were able to smile - briefly. What none of the parents then realised (and neither, I think, did we) was the acute financial situation of the Lycée. It had been founded with no capital behind it, the expected enrolment hadn't materialised and the coffers were empty. By the end of the first term, Christmas 1964, there wasn't event enough cash to pay the meagre salaries of all the staff, and one, at least, had to wait for his salary until January, when the first fees for the second term were paid. Even stricter economies were obviously necessary; but since we lacked even basic essentials, it was difficult to know just where we could cut down. The Director knew the answer, however; chalk was now bought one box at a time in France and handed out, reverently, stick by stick; a camping stove was bought on which to make staff coffee, so saving on electricity bills! Laughable? Looking back, yes. At the time it was just demoralising beyond words. Then an event occurred outside the Lycée which really made us give up hope. The bank in Versoix where we had all our savings (brought over from England) closed without warning. The Lycée's account was also in the same bank, but since that account was virtually empty, it hardly mattered. For us, however, it was a different affair. Now, we didn't have any reserves to fall back on and were totally dependent on our salaries from the Lycée. If we'd had the price of the fare home, we'd all have given up there and then. The grapevine works wonderfully well in Geneva, though. Almost overnight, the news spread and we found ourselves overwhelmed by the concern of so many parents. We were showered with invitations to dinner and everywhere we went, we were shown so much kindness and hospitality, we felt we just couldn't let everyone down. Even in those darkest of days, we knew the Lycée was needed and that we had a responsibility to students and parents which we couldn't refuse. We'd fight on, come what may. What came was that, a few weeks later, the Director decided to sell the Lycée if he could find a buyer. And sure enough, a potential buyer appeared, in the form of a Swiss business man, already owner of a private school in Geneva and of another one in Gstaad. While negotiations were continuing, he invited the four of us to Gstaad for the weekend. It was not a total success. It was not his fault that the evening at the Palace Hotel which he arranged was rather a disaster. We'd gone to Gstaad to ski, never dreaming of the high life, and an anorak, jumper and skirt are not the normal apparel for a gala dinner and show at the Palace! But what disconcerted us most of all was that in his school there was not a single classroom to be seen, not a textbook, not a piece of equipment beyond a blackboard in one corner of the dining room. His ideas of education were obviously not ours. Thereafter, negotiations tailed off, until finally, for reasons which only he knew, he decided to abandoned his bid for the Lycée. This happened during the Easter vacation, 1965, at the end of the Lycée's second term. I was alone in the flat at the time, the other three having gone away for a few days' break. I remember very clearly that, when the phone rang at around 10pm that evening, I had a sudden premonition of disaster. It was the Director, to say that the Lycée could no longer continue. He proposed to send out letters the following morning to all the parents, advising them of his decision. I couldn't believe it. All those months of hard work and uncertainty for nothing. The Anglo-American section was, in fact, beginning to thrive; we'd doubled our opening numbers, despite all the difficulties; we'd got a terrific crowd of students with wonderful parents behind them. We couldn't just close like that. All the time he was talking, my mind was racing. What could we do? What could we do? By the time I put the receiver down I knew. We must try to get the parents even more involved. None of them had any idea of just, how bad the situation was. We'd established such a good relationship with them, I knew they'd do all they could to help - if it wasn't already too late. I immediately rang up the one who lived nearest and arranged a breakfast meeting with him for the next day. I told him just what the situation was. He listened intently, then rang the Director and asked him to postpone his announcement for 24 hours. 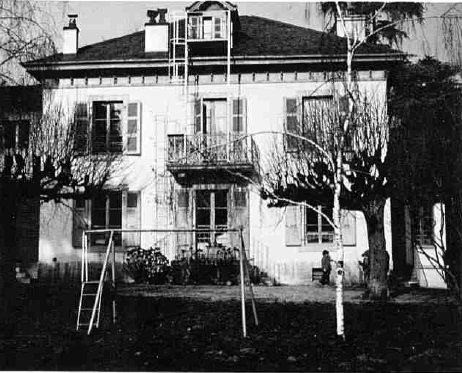 The telephone exchanges in Geneva must have run red hot that day, as every parent was contacted, told of the situation and asked if he was willing to help. The response was magnificent. Before the 24 hours were up, the idea of the parents forming a co-operative to take over the Lycée, had been born. An idea is one thing; the reality is another, however. It took weeks and months of discussion and investigation to establish that reality. Midnight meeting after midnight meeting took place. Secretaries in the international organisations and multinational firms found themselves typing out documents having no concern with the work they normally handled. Finances were gone into really thoroughly, debts and potential assessed, exact phraseology of the co-operative charter argued over in the minutest detail. Meanwhile, the day-by-day routine of the Lycée had to continue and that under increased difficulty. Finances being as precarious as they were, despite the voluntary donations of firms and parents, it was decided, for a while, to manage without either secretary or caretaker. The teaching staff did such secretarial work as they could after the school day was over; students were armed with brushes and pans for a daily clean-up of the building before going home; during the summer vacation, parents, students and teachers re-decorated the whole house from top to bottom. The miracle was happening! When the Lycée opened at the beginning of its second year, it was with an increased enrolment, extra staff (including, to everyone's relief, a secretary and a caretaker) and tremendous spirit. Though we didn't realise it at the time, it really was the beginning of the upward climb - a long difficult climb, beset still by so many problems, but upward nevertheless. Not, however, upward for all. As the second year drew to a close, it became increasingly obvious that the French section was proving a financial drain which would be fatal to the Lycée as a whole if it continued. For a variety of reasons their numbers had not increased as ours had, yet their expenses were higher. The Anglo-American section was now just paying its way, but the school as a whole was still losing heavily and with no finances behind it but the fees, there was obviously only one possible end to that course. Reluctantly, and not without animosity from certain quarters, it was decided to close the French section and run the Lycée as an Anglo-American school. In the summer of 1966 this was done, so that for the opening of the 1967-68 school year, the whole building was at the disposal of the English-speaking students, whose numbers continued to grow. More staff were appointed, a limited amount of new equipment bought. That year and the next were ones of consolidation and constant financial difficulties. Bank debts still loomed high on the horizon, expenditure had to be watched to the last centime, the midnight oil burned long over the account books. But somehow the Lycée survived and its spirit burned brighter and brighter. The teachers began to be able to devote more of their attention to teaching and less to problems of survival, and meetings with parents now took on more of a PTA atmosphere and less of a "what-desperate-emergency-is-facing-us-this-time" air. Finally in 1968, a highly qualified Headmaster was appointed, who immediately realised that what the Lycée most needed now was a look at the outside world. The first four years had been so fraught with problems of survival, we'd never had the time to 1ook beyond ourselves, to establish contacts with other international schools, to become extroverts instead of introverts. Now was the time to remedy that. The Lycée must become part of the whole of international education and not just a unit in itself. Looking back now, I see what a wise and necessary step in the development of the Lycée that was. So far in this report, I've deliberately not mentioned any individual by name, because I felt it would be unfair to pick out any one, when so many did so much to establish the Lycée, and its spirit. The mother who cleaned out the toilets in the caretaker-less days is just as important in the story of the Lycée as the father who spent hours working on the accounts; the mothers who made hot dogs on a Friday just as essential as the lawyer who worked on the constitution; the fathers who provided computer paper for art classes as important as the mother who built up the library from nothing. Thanks to all of them, for their help, encouragement and friendship, for their timely words of appreciation when the going was really tough. But most of all, I believe, the Lycée owes its thanks to Judith Turner (now Mrs Judith Slack) [pictured right]. Judy was one of the original four, she stayed with the Lycée through thick and thin, she did more work than any one person should ever be asked to do, she was the constant spirit behind its whole development, she was the friend and inspiration of so many students, she was always there to listen, to help and to advise. I have no doubt at all in my mind that without Judy, the Lycée would have gone under, and I know I speak for so many when I say - "Thanks, Judy". Barbara Scheiwiller taught at the Lycée des Nations from 1964 to 1970, before moving with her husband to the Swiss German canton of Schwyz, where she lives today. She subsequently taught for 19 years at a Commercial College in Lachen, SZ. The text above was published in a commemorative brochure on the occasion of the closing down of the Bellevue campus. The full text of that brochure is available in our From the Archives section. @William - our pleasure! Glad you found it interesting. Thanks for posting this -- a really interesting read!